Well I’m sure you’ve all heard the news. ESRI is now an Amazon Independent Software Vendor. This means of course that we’ll see some ArcGIS Server in the Amazon Cloud very soon. In fact if you are an ESRI ELA user, you can take advantage of this right now using one of the pre-built AWS AMIs. Licensing still hasn’t been outlined by ESRI, which is probably why the ELA is required, but it seems like we could be close to hourly ArcGIS Server instances by next year. The AMI isn’t anything special, just a Windows Server AMI with ArcGIS Server at this point. The WeoGeo booth was right next to Amazon (or maybe Amazon was right next to WeoGeo, hmmm) and there seemed to be some traffic and lots of questions. Answers weren’t that concrete from what I heard and Amazon looked rushed into being there, but it did appear people made an effort to seek them out and talk about GIS in AWS. At this point ESRI and Amazon is so early in the public relationship that we’ll have to wait for the BPC/DevSummit or most likely the International UC to get the real details. OK so ESRI in the cloud didn’t knock your socks off, the inevitability of the whole thing at this point seemed to make many feel like it was anticlimactic. Tough world we live in. Jack’s plenary talk was as always razor sharp on what ESRI is doing for their Federal customers and as always sets the stage for the year. As I alluded to early, the phrase “Cloud Ready” is something we’ll be hearing a ton about with ArcGIS 10. This means a couple things, first off it integrates with other cloud services with the REST API (something many have already been doing for years), second they’ve got this Amazon AWS AMI which you can license to run a full ArcGIS Server (without any scaling of course) in Amazon’s cloud and third I think it means that ESRI’s web services are going to essentially make even private or internal clouds “GIS Ready” (that’s my term in the spirit of Cloud Ready). I think the Plenary was well received by the crowd, but they seemed quiet. I’d probably feel the same way if Mother Nature dumped a ton of snow on me for a couple weeks. Some interesting take-aways from the talk is ESRI’s focus on private clouds, which I think aligns very well with the FedUC crowd. Their focus on mobile was very apparent and I think at this point every reference to a Windows Mobile device has been removed from Jack’s slides and replaced with an iPhone. ESRI’s focus on web services means that they can transition to mobile devices with their mobile APIs (Ah, here is the iPhone API ready to work). Jack focused on the large picture architecture of ArcGIS 10 and then it came for others on the ESRI team to come out and demo. We saw a good overview of ESRI’s ArcGIS Online map services. This world Topo map ESRI has been working on is really special. The cartography just catches your eye and that it goes down to 1:1000k 1:1k (off by a little scale factor there) scale in large cities really makes me want to use it instead of street map services. ArcGIS Explorer Online is a really slick Silverlight app that seems to emulate much of the ArcGIS Explorer (except 3D of course), which might be a good general GIS web services browser for ESRI users. They keep hiding the URL so so I can’t share it, but it was something like http://explorerweb.arcgis.com or similar. We’ll see it soon enough I guess. Then the most surreal part of the whole FedUC occurred. John Calkins ran over his overview of ArcGIS Desktop 10 as he always does. If you’ve never seen John give this talk, you can view one here. John as always did a really good job and some of the refinement of ArcGIS Desktop 10 is simply amazing. The editing environment, threaded geoprocessing and symbology improvements really puts ArcGIS Desktop way beyond anything any other GIS vendor is doing. But what caught me off guard was the crowd’s reaction to it. As I said earlier, the crowd seemed tired and not into things, but during the Desktop demo I heard some things that really amazed me. Here was a crowd that I thought would eat Desktop alive because they spend all day in it and many just didn’t care anymore. (Note: I don’t have super hearing so I could only listen to those in front or behind me) Could we finally be at a big shift in mentality where we are breaking out of these large legacy desktop clients and toward lightweight mobile and web clients for analysis? Are users finally listening to our “web is where the magic happens” talks and taking it to heart? Not sure, but it was interesting. Now before everyone declares desktop GIS dead, lets be realistic here. Content creation tools are still not developed on mobile devices or web clients to the point were you can get the accuracy you need so for many users Desktop is still a required element and will probably be for decades to come. But I do think that average users of GIS, even those institutionalized in the federal service, are ready for this mobile, crowdsourcing future that we are just about to enjoy. Yep, Jack talked quite a bit about VGI (Volunteered Geographic Information) which of course is a term used to describe crowdsourcing/neogeogrpahy/participatory GIS or whatever else is the term of the hour. Dave Smith did a really good job of summarizing crowdsouricng and ESRI on his blog so I’d like to point you there from some reading. ESRI has put thought into ArcGIS’ place in VGI and how users will want to get information in and out. I think as ArcGIS 10 progresses we’ll see much more on this and how ESRI users can edit things such as OpenStreetMap directly from their ArcMap clients. I think the International UC should show us much more detail on how this is going to all work. We at WeoGeo of course were on the floor showing what we are doing with ArcGIS and the cloud but so were many others. Amazon was there of course as I said. GeoEye was but DigitalGlobe wasn’t. NAVTEQ and DeLorme were, but TeleAtlas wasn’t. I saw friends at VoyagerGIS and Arc2Earth (who was at the New Light Technologies booth) were there showing their latest products. Ran into Stu Rich at PenBayMedia showing off some of their very impressive building interior modeling and of course everyone else from SAIC to lone GIS professionals who stopped by to say hello. So as always the FedUC kicks off the ESRI year. We’ll see much more at the BPC and DevSummit next month, but the message is simple. ArcGIS 10 will interact with “the cloud” no matter what that term means to you. The more I see with ArcGIS 10, the more I can see why they named it 10 rather than 9.4. 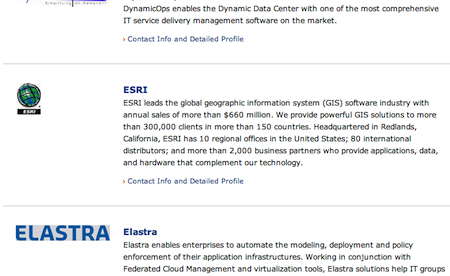 It really is a break from what ESRI was doing in the past on both the Desktop and the Server. ArcGIS 10 should arrive early Summer (not to jinx anything of course), probably before the International UC so we can all give it a test run before we show up in San Diego. I hadn’t been to a FedUC in more years than I can recall. It was really great to see how much this conference has grown and how many more people are interested in geospatial technology as well as how people have embraced the concept of web services, web clients and mobile GIS as more than just a display tool. Should be a very exciting year.